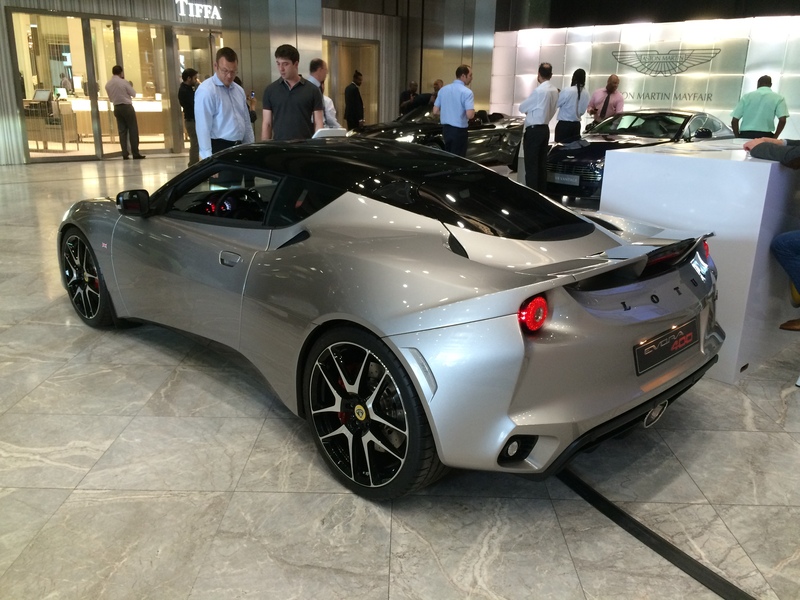 Lotus Evora 400 – the new saviour for Norfolk’s finest? A tangible relic of the Dany Bahar years at Lotus is the Lotus shop at the bottom of Regent Street in London. Regent Street is one of the most prestigious retail addresses in Europe and I shudder to think of what the rent must be. Whenever I have been in the shop its largely been empty. The Ferrari shop further up the road is much busier – underlying Bahar’s folly in trying to turn Lotus into a British Ferrari when the money and, more importantly, the brand reputation, were not there. Lotus are probably tied into the shop for a few more years so it remains open – but with T shirts costing nearly £100 I can’t see it making much of a contribution to filling the financial black hole that is Lotus. 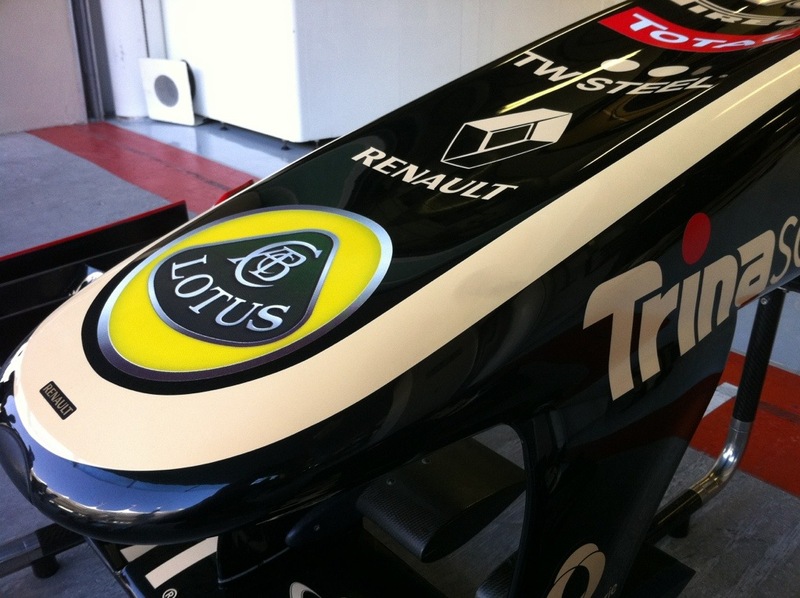 Lotus’ current management take a much more conservative view of what can be achieved with the brand. Out has gone the proposed new models, most notably and regrettably the new Esprit which was almost ready for production when it was canned. For the immediate future Lotus just seems to be keen to sell more of its existing range. That strategy seems to be paying off with an increase in sales this year but whether it will be enough to provide a long term future for the company is uncertain. 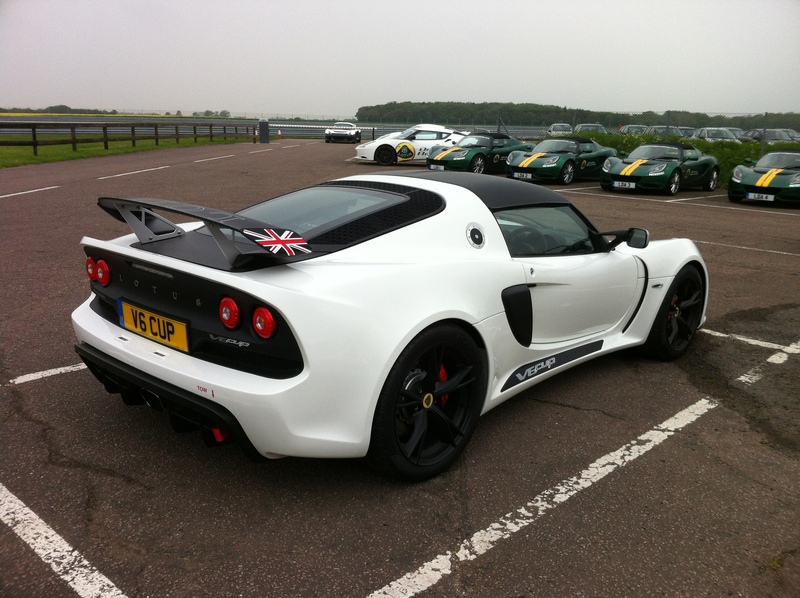 There certainly seems to be a ready market for Lotus’ excellent sports cars – especially amongst club racers. On a recent trip to Hethel the racing division seemed very busy churning out Exige Cup cars. 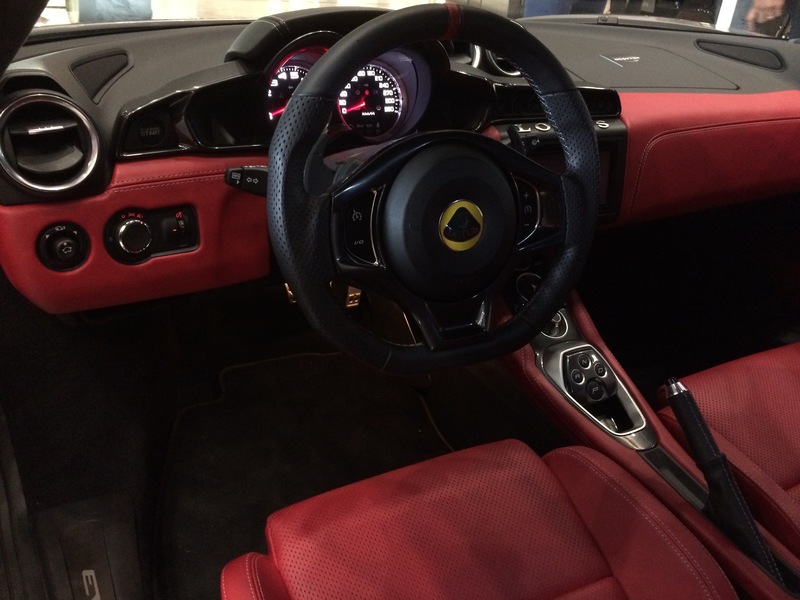 It is by selling its more expensive cars, however, that Lotus hope to escape the financial mire. 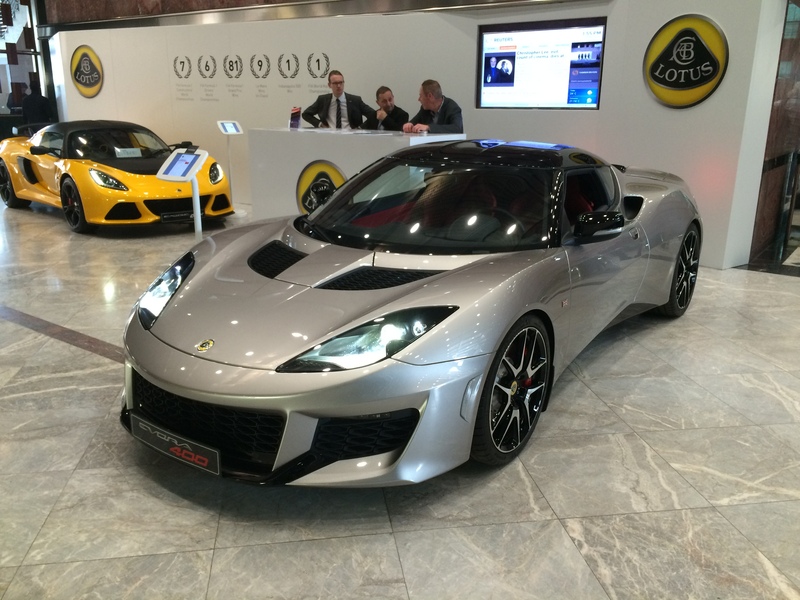 In particular Lotus are looking to the new Evora 400 to boost sales. The Evora is not, of course, a new car. I remember when it was launched. I so wanted it to be good but just one look at its ugly snout and high waistline made me realise that it was never going to sell in the numbers Lotus hoped. I have driven a couple of Evoras and they do handle well and they are fast. Indeed they were not far off Porsche in that regard. But the build quality, reliability and depreciation of the cars I drove were much worse. I remember going for a test drive of a new Evora and they could not get it started due to some unknown electrical malady. It had to go back to the factory in the end. Not a way to instil confidence in a prospective customer. The new Evora 400 is supposed to improve the car in all ways and make it a desirable alternative to a Porsche. It is apparently more powerful, more luxurious and more comfortable than the old Evora S. I managed to get a good look at one at Motorexpo at Canary Wharf in June. 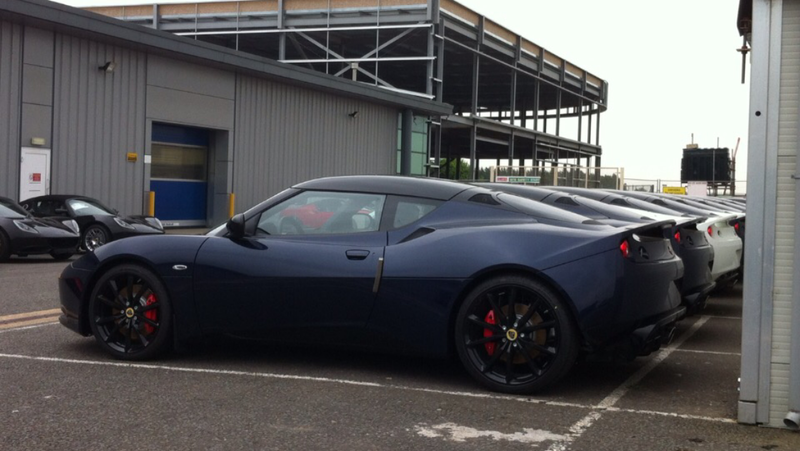 Certainly the Evora 400 looks more striking than the old Evora S but its still not pretty. Its also costs significantly more than the old Evora S. The biggest changes are inside. There has been a big step up in quality and its now easier to get in and out of for middle aged blokes like me. But the seat adjustment lever still came off in my hand.. I have always admired Lotus. My earliest memories of F1 are the black and gold Lotus JPS’ and for me the most desirable Bond car was always the white Lotus Esprit S1 from the Spy Who Loved Me. As I have got older its the engineering genius of Colin Chapman that has impressed me. But at the back of my mind there has always been uneasiness at Lotus’ reputation for building fast but fragile cars. The list of injured or killed Lotus racing drivers is horrifying. For the road car driver there was perhaps less risk of physical injury but greater risk of embarrassment and financial harm. I had thought Lotus’ reputation for building fragile cars was a thing of the past and that now, whilst they might not be as reliable as a Porsche, they were at least as safe. Then last week the wheel fell off a friend’s Elise whilst he was doing 90mph on a motorway. The lightweight suspension on his car had corroded away and collapsed. 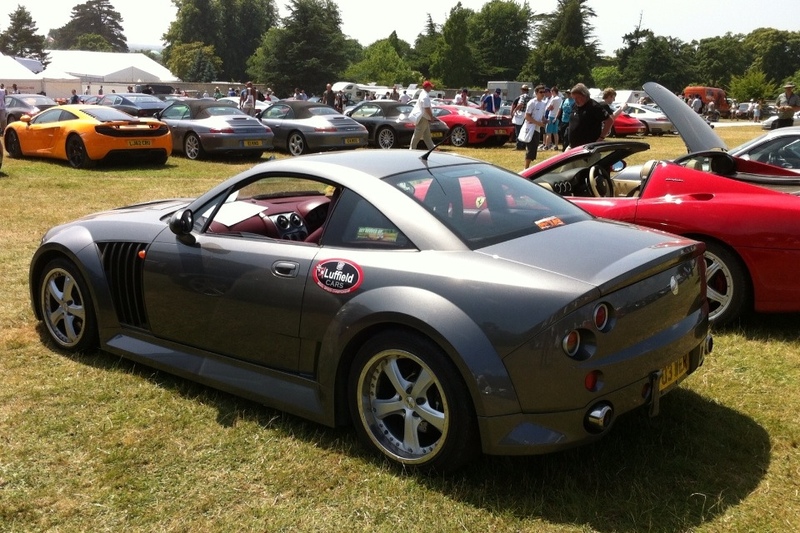 OK it was a 15 year old Elise but there are plenty of 15 year old cars on the road which manage to keep their wheels on. He was OK but his, and my, faith in Lotus took rather a knock. Of course Lotus don’t help themselves when it comes to selling cars. Apparently the car pictured above was the only finished 400 they had for a long time. Unbelievably they failed to take it to the Goodwood Festival of Speed when they could no doubt have taken many orders. And whilst the 400 has been shown to the press and marketed for nearly a year now, deliveries to dealers and the first customers will not start until late Autumn. That doesn’t sound like a great time to launch a new sports car. Still, whilst I will probably not be a customer, I hope that many others will be. It would be such a shame to see Lotus disappear from the industry. Beast’s claim to fame is being the oldest surviving production MG SV. She was a works car and was used for promotion work when the car was launched in 2003. That year she was prepared for the Goodwood Festival of Speed and spent the weekend in the supercar paddock and being driven up the hill by luminaries such as Australian multiple F1 champion Sir Jack Brabham and the designer of the car (and the McLaren F1) Peter Stevens. So when earlier this year the Goodwood Road Racing Club announced that there was to be a new area of reserved parking at the Festival of Speed for visiting supercars I was determined that the Beast should have the chance to mix it with the Ferraris, Lambos and other exotica. The organisers were supportive and allocated me a ticket when they found out the Beast would be revisiting the Festival nearly 10 years to the day since she was last there. Getting a ticket was not as easy as it sounds as the organisers had a list of what they thought of as supercars and MGs were not on it! 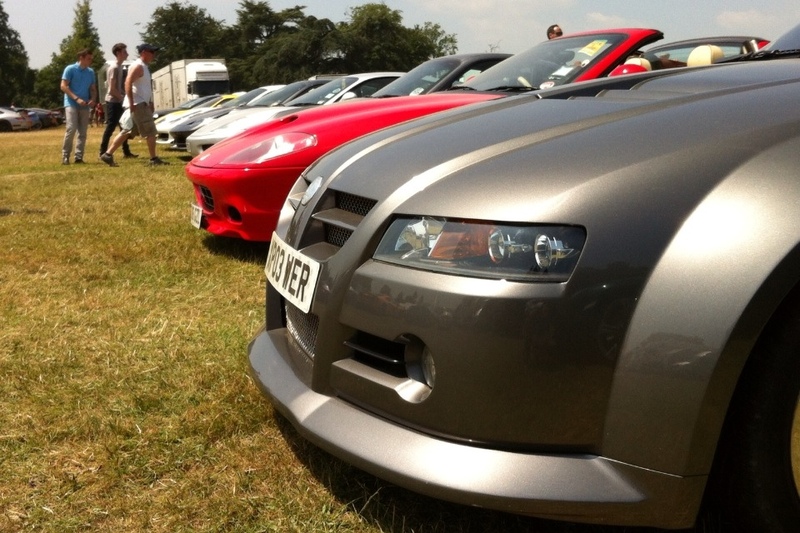 Only two door Ferraris were allowed, and amongst the volume brands only Jag XJ220’s (no other Jags) only Lotus Esprits and Evora S, 911’s but for this year only, and only SLS Mercs (no AMGs). So pretty exclusive company! 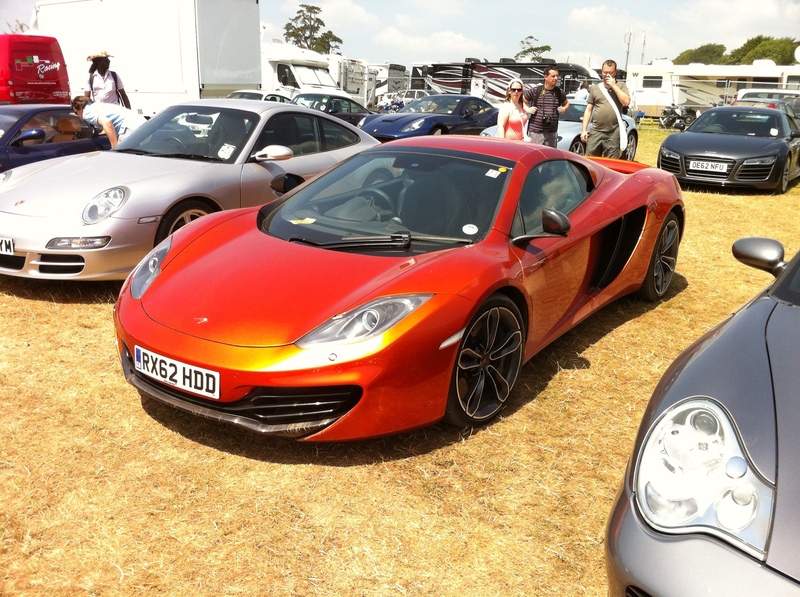 The Beast attracted lots of attention, indeed more than the McLaren MP4 12 c and Ferrari V12 parked next to it. 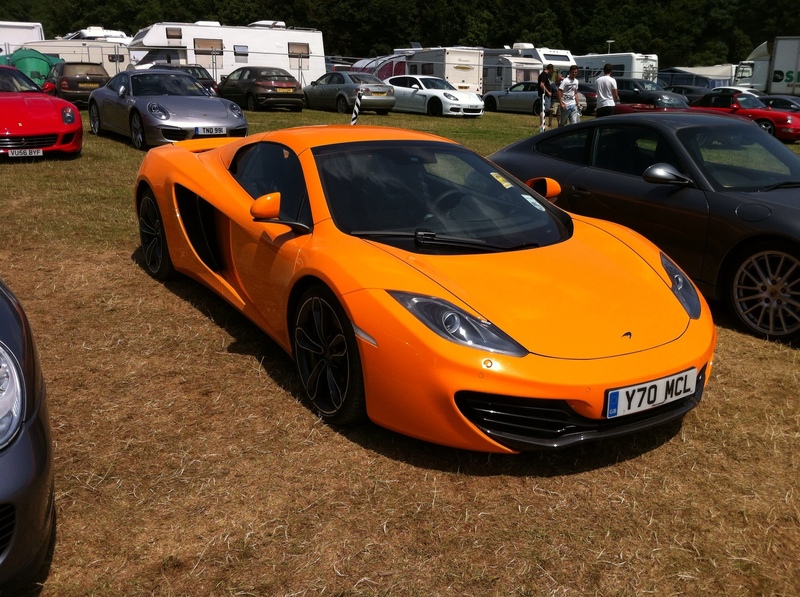 In fact there were 23 McLarens present so they were considerably more common than the MG! Surprisingly there was only two Ferrari 458’s when I had been led to believe that they were, when compared to the McLaren, the better car. Clearly the Festival crowd are a patriotic bunch. McLarens – any colour as long as its orange..
As it was the 50th anniversary of the 911 there were plenty of Stuttgart’s finest. Next year its said they won’t be allowed amongst the supercars but this year the super car car park would have looked a bit empty without them so it would not surprise me if they get a reprieve. I suspect the attention focused on the Beast was the result of her striking looks and the fact she is such a rare car. 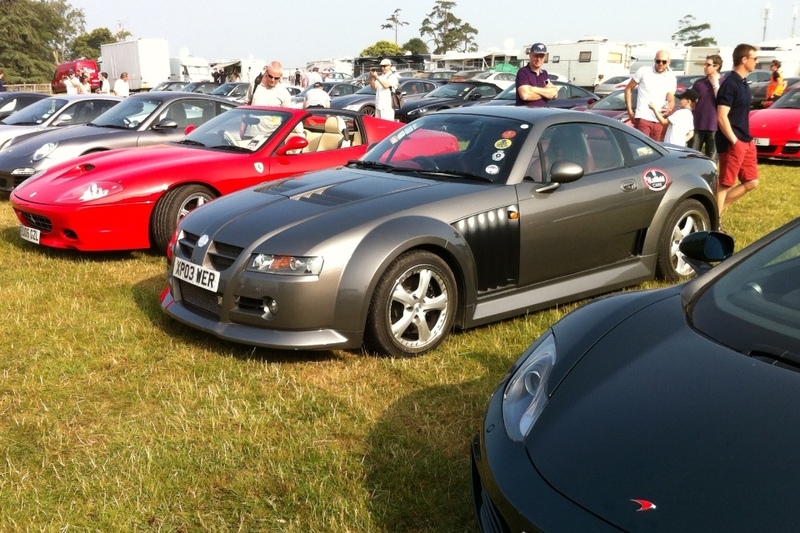 One of her admirers turned out to be someone who had worked for the Isle of Wight company who had made the carbon fibre blanks used to construct the bodywork of the car. The Beast was the first complete SV he had seen. The lead up to the Grand Prix is always fun. 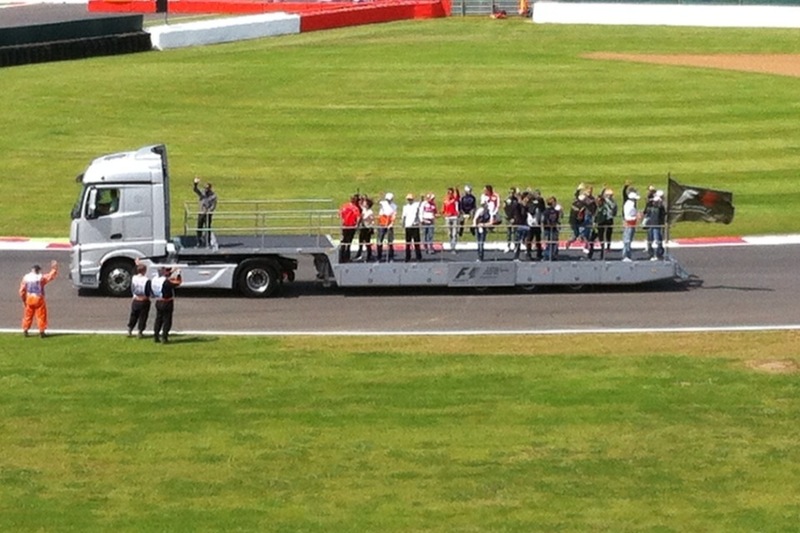 Arriving early in the morning, watching the GP2 and Porsche Super Cup races and then the drivers’ parade. After that there is time for a quick burger and a stretch in the sun. Some fans take their support beyond baseball caps and shirts with logos. 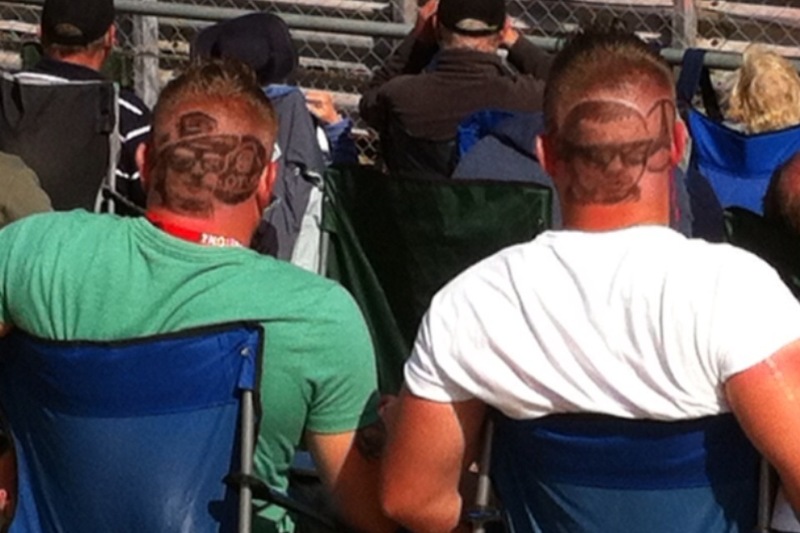 Have a close look at the hair cuts of these two blokes. 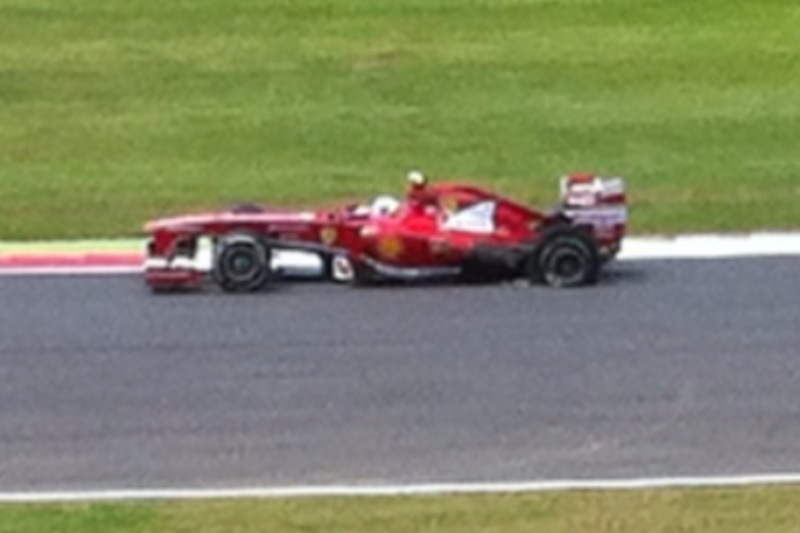 Kimi and Lewis would be pleased! 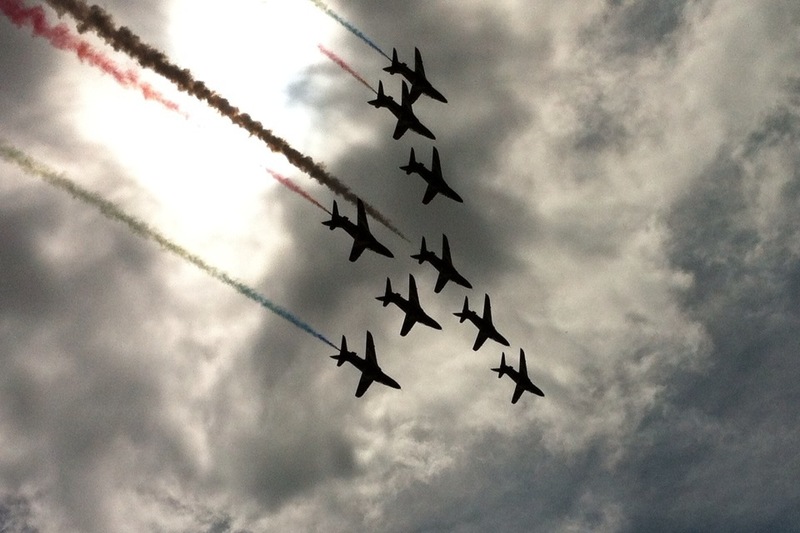 The Red Arrows always put on a terrific display. 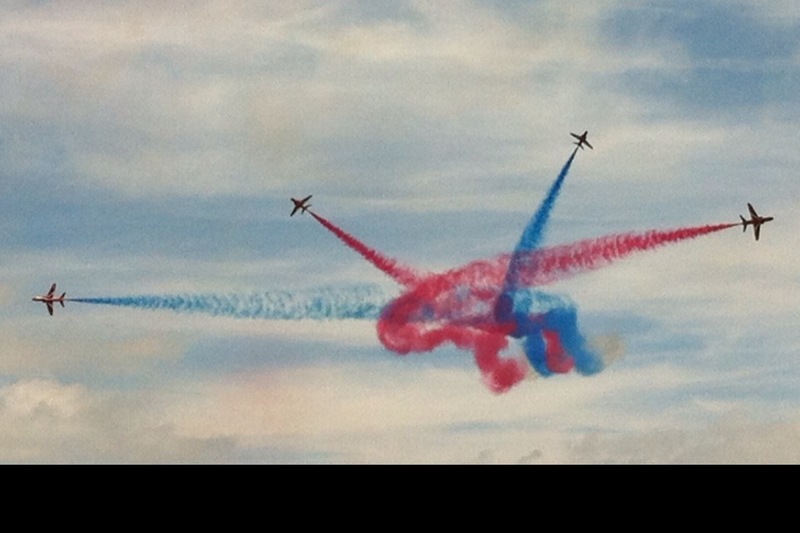 No big British summer event would be complete without them! Sadly I was too far away from the track to be able to take good photos with my iPhone but here are some rather poor efforts. 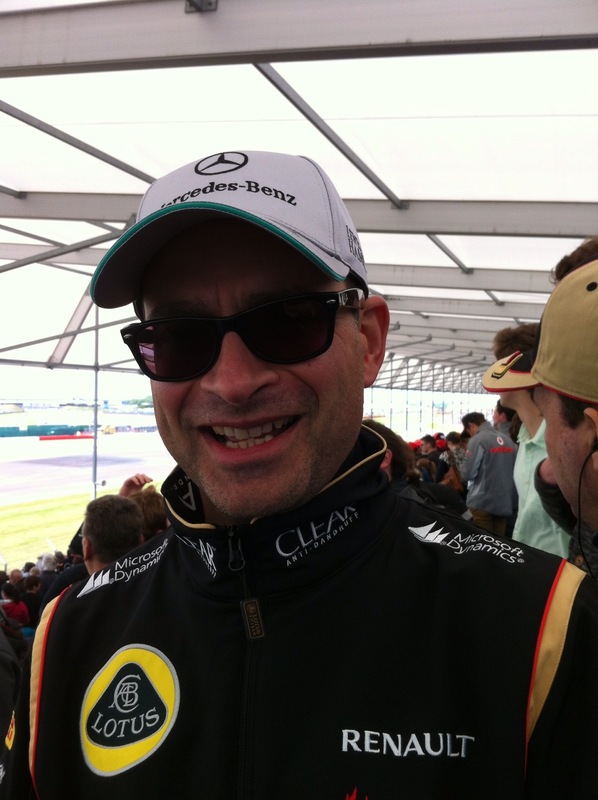 Sadly Silverstone was the last GP I will be able to attend this season – can’t wait till next year! I head off to Silverstone at dawn tomorrow for the British Grand Prix. There is always a great atmosphere at Silverstone where despite eye watering prices over 130,000 spectators regularly watch the race. It should be exciting tomorrow. 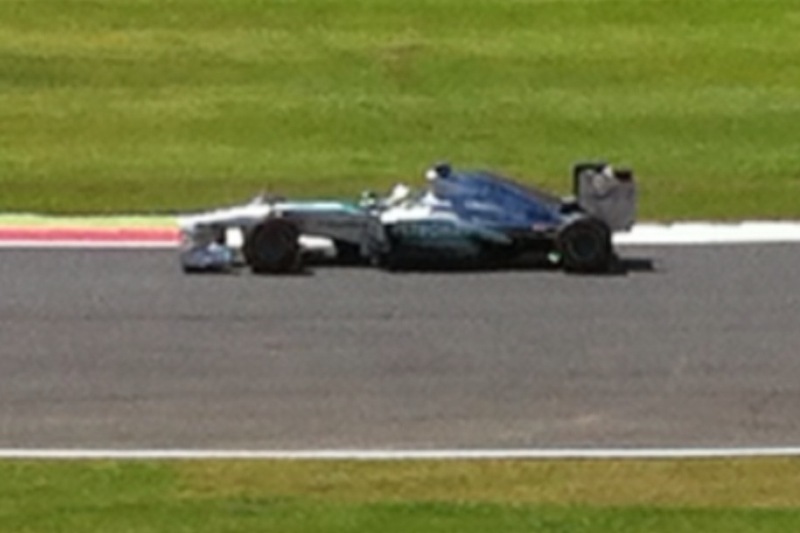 Qualifying was thrilling, with Mercedes getting the better of Red Bull again. Hamilton seems to have finally got the measure of his car and stormed to pole with the only sub 1 minute 30 second time, nearly half a second quicker than team mate Roseberg. Vettel was the quickest of the Red Bulls but Paul D Resta gave British fans something else to cheer about with a fantastic P5. Will he finally get the podium place he so deserves? Ricciardo also did very well at P6 – perhaps motivated by the soon to be vacant Webber seat at Red Bull? 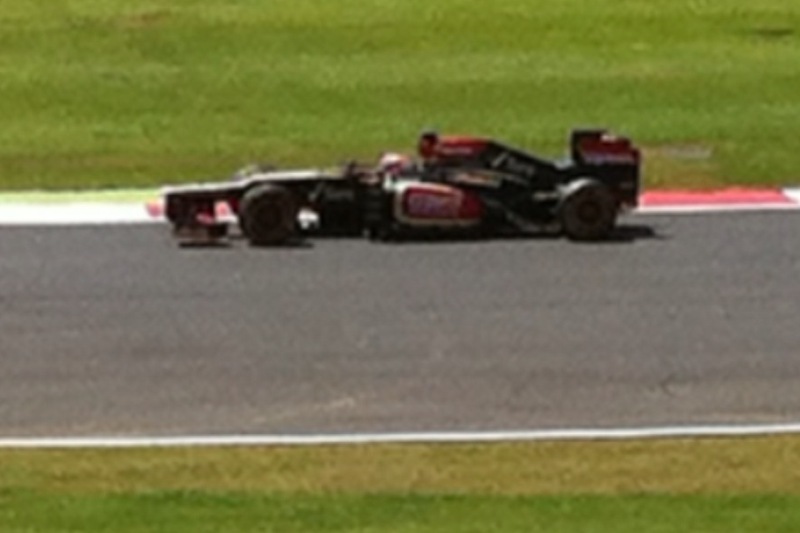 Conversely the Lotus struggled to P8 and 9 and the Ferraris did even worse, Alonso managing only P 10 and Masa P12. 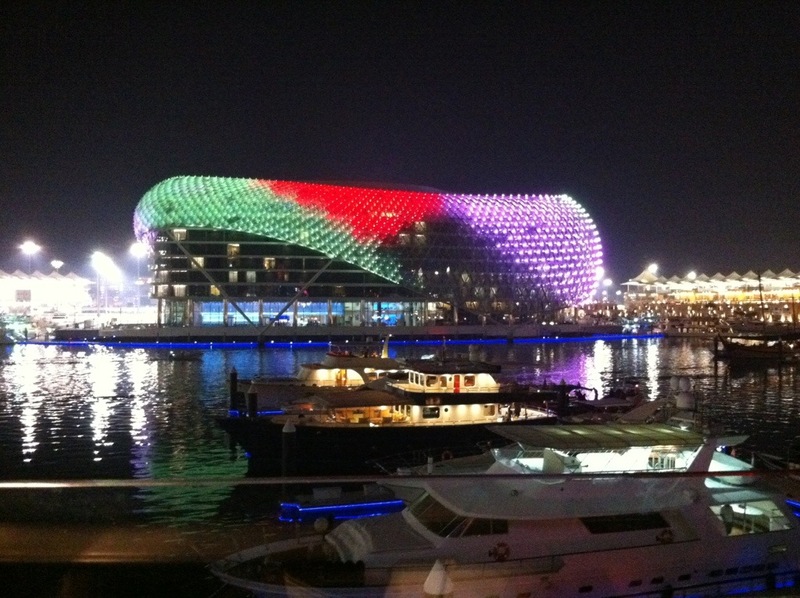 But the news was far worse still for McLaren and Williams with both teams failing to make it out of Q2. Hamilton’s much derided decision to leave McLaren for Mercedes now looks increasingly sensible. 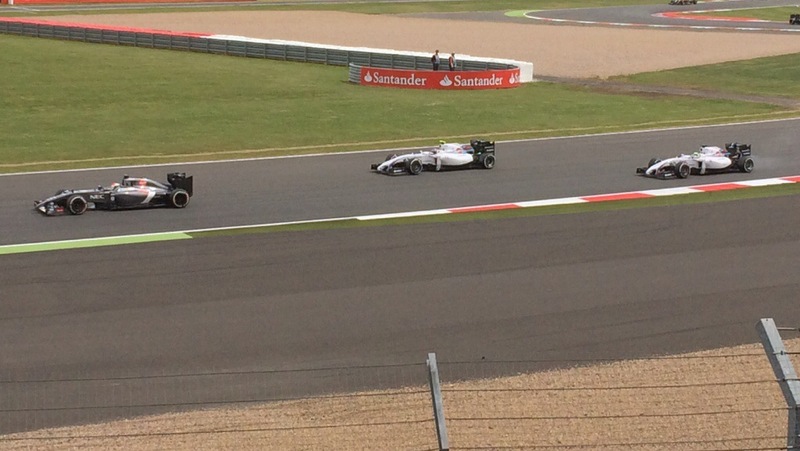 Williams’ sad slide to oblivion is beginning to look irreversible. Whilst I’ll be in my Lotus shirt tomorrow I’ll be cheering on Hamilton and Di Resta and wishing the best to the other Brits. A victory for Hamilton in a Mercedes would be a fairy tail mirroring Moss’s first British GP win for Mercedes in 1954. 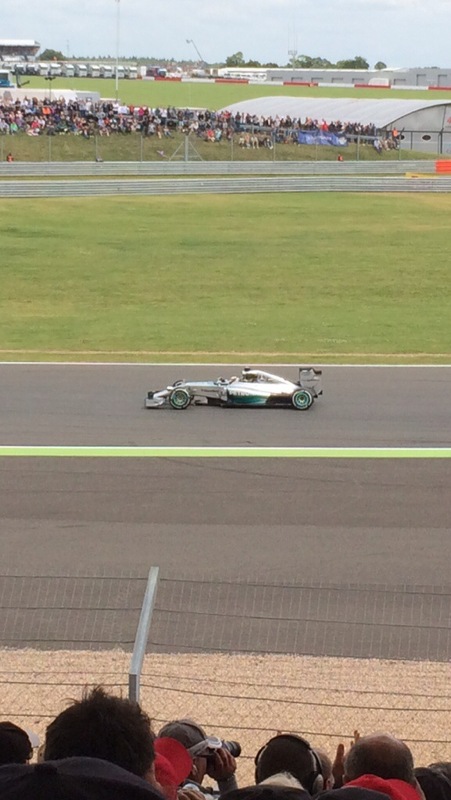 But whilst Mercedes seem to have the pace for qualifying Red Bull seem stronger in the races. Can Mercedes hold Red Bull off this time?